American’s are known as a snacking nation. The trend to eating every few hours has really caught fire. If you are going to snack you certainly want them to be healthy snacks that are also quick, easy and affordable. The fitness industry suggests people eat every couple of hours to keep their metabolism going. Although this may be true, if it is not done correctly, it can easily derail your health goals. You want to be assured that all of your snacks contribute to your health as opposed to taking away from your health. One health trap that consumers fall into is buying food that is marketed for snacking. Whole foods that are fresh and not out of a package are best. Even leftovers can act as a quick snack. Try to avoid bars, candy and sugary snacks or crackers filled with white flour. Try grabbing some fruit or cut up veggies instead. The trick is to have them prepackaged ahead of time, This is where an ounce of prevention comes in handy. Before you even start your week, have some chopped veggies prepared in advance and put into little baggies as well as portioned out snacks in containers. Some of my favorite go-to fast snacks are fresh fruits, nuts and seeds. I prepare a bunch of protein balls to keep in the fridge to grab-and-go. Chia pudding cups, which can be eaten for snacks are also a great breakfast option as well. Protein is great for muscle recovery, concentration and helps to make you feel full longer. When shopping for snacks think fresh. One way to assure this is to shop the perimeter of the store first, This is where the freshest food resides. When shopping in the inner isles, have a shopping list in hand and stick to the necessary items on your list. Try to avoid snacks that come out of a bag, box or can as they are not as high in nutritional value. If you must purchase something pre-packaged, make sure you recognize every single ingredient on the box or bag and aim to find snacks that have 7 ingredients or less. In general is it necessary to snack? This is a great question and one where I would ask you to tune inwards. Ask yourself why you are eating. Are you genuinely hungry or are you in need of something else? Maybe it’s water, exercise, a good stretch, fresh air, or simply a hug. If you determine that you are indeed hungry, eat, slow down and savor every bite. Food is meant to be enjoyed! Many of us fall into a trap of either shaming ourselves about eating or perhaps are distracted and just not thinking about it at all. Food is necessary for all of life. Eat like a king in the morning a queen at lunch and a peasant at dinner. Calories are a unit of measure for energy. You need more calories during the day when you need more energy. Ironically most people eat the majority of their calories at night when they are getting ready for bed. Snack, if needed, in-between meals and learn how to relax and enjoy your food again. This article was taken from an interview between Sherri Mraz and Dr. Shelly Plumb at Plumb Talk Women, where they are on a mission to spread the message of good health. Here are three easy snack recipes that have the added benefit of being a breakfast food as well! Enjoy! 2 servings, can double for week, last a week. Add to jar, shake, store in fridge at least 4 hours. Give a shake every once in awhile, so the seeds don’t clump. Can eat for a snack, breakfast or on the run, can top with coconut, chopped fresh fruit, whatever. The chia seeds are a GMO and gluten free whole grain filled with fiber, protein and loads of Omega 3’s. The cacoa powder is a superfood filled with anti-oxidants and minerals. You can sneak in greens or add protein powder for extra nutritional boost. You can double or triple and add to mason jars for week. The dates in this recipe are filled with fiber and are an excellent source of minerals, calcium, iron, magnesium and zinc. The hemp seeds are high in omega 3’s and 6’s which help balance hormones while the cinnamon helps lower blood sugar. Good source of protein and omega’s, great to have before or after a workout. It’s also great for children in order to boost their cognitive powers and concentration before a big test or study session. Mush together and roll into balls then refrigerate. Oatmeal is a great source of fiber, which helps to reduce your LDL, (your bad cholesterol). While the coconut oil is a healthy saturated fat, which increases your HDL, the good cholesterol. Adding in the peanut or any other nut butter boosts the protein in this snack while the raw honey adds amino acids, minerals and 5,000 enzymes! This snack gives quick energy while helping digestion. Are you passionate about teaching others how to eat healthy food? Does it seem that people are always asking you what they should eat? Maybe you are really good at hacking recipes and making them healthier. Why not make a business out of it? And, if you are a coach this is the perfect way to grow your business. As strongly as I feel about this, I feel even more strongly that it’s not all about the food. You can be an amazing chef and educator but still not be building your business. You need a strategy! In the Academy we go through a unique roadmap system that helps you systematically build your business. In the meantime, here are 5 top ways to get you started. You don’t have to be so different from everyone else you just have to be authentic. We are all here for a purpose, let yourself TRUST your unique gifts and let them shine. If you don’t know what you are good at, ask five people who know you well, “What would you say is my strong point, what should I teach.” Ask yourself why you are doing this in the first place. You can earn a living from just teaching classes but if you want to build up a coaching practice you must learn how to map your programs and services. The class may not be the final destination. Where do you want your people to go next, always sign them up for the next step. Use a sign up sheet at every class and event you do and create a free offer for your website. Learn how to create valuable content that creates loyal followers and how to deliver it. All successful entrepreneurs and wellness guru’s have a book. In the Academy we show you how to get this done super efficiently. This will build your brand like nothing else. It will get you booked and become the base for your brand. Create a website that let’s people know who you are. Your website should match your personality and become a center point that all your information feeds to. 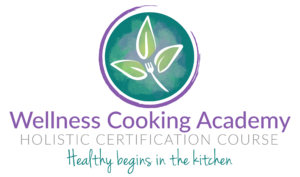 Check out the Wellness Cooking Academy. I have created along with my team of experts a 12 weeks virtual course that systematically builds your business. We use done-for-you programs to make it super easy and turn-key. You don’t have to struggle on your own and stay stuck in overwhelm. Enrollment is open until Sept. 11th. Do you have a happy place? Do you take time to recharge? Everyone needs to recharge their batteries. We do not have a never ending supply of energy. If you don’t rest, sleep and take mental down time you will burn out. No amount of coffee is going to keep you productive. Your mind will dull and you will crash and burn. I consider this to be a success blocker. 1. Busy Work. There was a day when I was working all the time but not getting anywhere. My busy work phase was in large part due to the fact that I had no idea which task was going to bring me results. I was seeing all my tasks as equally important, and I had to get them all done. You must choose your top priorities. Which tasks will bring you money? This has to be your top priority. Without making money you can’t stay in business. Examine your networking, is it really getting you the results you want? If you want to be known in your area as a healthy eating specialist, network in person. If you are promoting an online program, skip the local networking and spend more time on social media platforms. I used to network a couple of times per week, and although I met some amazing people, it didn’t do anything for my business. But, adding key words to my website has gotten me tons of business. Time is valuable, don’t waste it. Schedule blocks of time to get your important tasks done. Work in 90 minute segments and do not allow interruptions. Remember Parkinsons Law, the job will stretch to the time you give it, stay focused on the task until complete. Watch out for procrastination, ask yourself why you are procrastinating. Is it because you don’t know how to do it, it’s overwhelming, or you are feeling uninspired? Ask for help, break it down into sizeable tasks and create chunks of time. 2. Self Doubt. Nothing will kill your business more than blending in and playing small. You are unique for a reason, don’t be afraid to show it. I remember when I was first starting out I used to look at what other health coaches were doing to make sure I was doing it right. You have a vision, follow it, don’t be afraid to pave the way to your greatness. Tell your story and create it into a brand that people are inspired by. You can’t connect with everyone but you will connect with those who share a similar story. Don’t be afraid to tell it and be yourself. 3. Lack of follow-though. How many times have you had a great idea only to later see someone else do it? Why them and not you? They followed through! Stay consistent, dreams don’t become reality by dreaming. The magic happens when a consistent process of dedicated action is applied to the things that matter most in your life. And make no mistake. Massive hard work is required. When you get committed on such a level, the sky is literally the limit. That is what has turned the impossible into the possible and is what makes the difference between a LEGENDARY life and an ordinary one. We have a lot more power than we often give ourselves credit for. All we have to do is want it badly enough. That part is up to you. Here’s to doing what actually matters – to you and to the world! I know that when you surround yourself with greatness you become greater. That is why I have put together a program of powerful tools and some real powerhouse instructors. Everyone needs a strategic plan and support to give them the confidence to go out and work their dream. Feel free to share with me your comments. I look forward to hearing from you. Refridgerate and enjoy! Use within a week. You can make a smaller batch, just reduce ingredients to half. This weekend my church postponed their planned sermon in light of what is happening in the world…a time to re-evaluate what is important. The world can be ugly and chaotic and if we are not careful we can get roped into the uglyness. You often hear me tell you to be true to yourself and to get your career in alignment with your core beliefs. Sometimes we just need to focus on sharing a message of caring as well. Life is happening all around us, we can’t live with blinders on. Keep love in your hearts for all people. How does that feel? That’s where we do our part by holding onto the light and don’t join in the darkness. We need to take self assessments and see what is going on inside of ourselves. The inside matters…more than the outside! But as long as we are going there, I recently passed by my mirror and noticed my outside. Being so focused on building the Academy I lost sight of my own balance. I eat healthy and take walks everyday so how is it that I gained a few pounds? Sometimes we plateau, it’s like when your hair product stops working or your favorite skin care isn’t doing its thing anymore. You need to switch it up. Our bodies naturally build up a tolerance to the products we use and foods we ingest regularly. We can even develop a sensitivity to certain foods. These foods then have to be eliminated for a period of time before trying to reintroduce them into the diet. We need to reboot the inside of our bodies. Change up our food regimen and do a good housecleaning inside our own Temple. Remember, your body is a Temple. Sometimes we forget to treat it as such. In the Academy our students will be receiving a Done-for-You Cleanse program. Most of the students will be doing the cleanse along with me, starting July 25th. How would you like to join us? Have you noticed you or your clients hitting a wall? Why after a few months do your clients see a lull in their results? Have you had clients return to you and their progress mysteriously slows down? Or maybe this has even happened to you. I am a big believer that a cleanse/detox can give you the boost you need. The first time that I did a cleanse I was amazed at how it helped me to discover my addiction to certain foods, and helped me to eliminate headaches! This is big if you have ever suffered that fate! Overall I just truly felt better. I was sold! Then I started sharing with my clients and they were telling me they were amazed at the results. Naturally, I had to share it with my tribe of coaches and now in the Academy. This is such a great service to add to your programs or as a cooking class add on. Doing a detox in the summer is the perfect boost. No matter how healthy we eat or try to be, we still accumulate toxins. Detoxing gives your body an opportunity to reset. It eliminates the sludge that has built up and lets you start fresh. From the beginning of time man has fasted. This gives your body and mind a break. By eating only fruits and vegetables, which are fast burning, your digestive system gets a rest. We have a private ongoing facebook group for support and questions so you won’t be alone. If you have considered trying a cleanse in the past this may be the perfect opportunity for you to jump in. I personally really love these groups and challenges. The one thing that I feel strongly about is that it’s very hard to succeed alone. Getting support and having a team are so important! I’m super excited to have the chance to work with you. Find out more about the program and get a little incentive coupon below to get you started! Want to join us for a 14 Day Cleanse?